Create one of a kind custom pillow cases, allowing you to liven up the room or just simply making it your own. With our simple process you can design your own dream pillow case even with a photo collage. Simply slip onto your existing pillows without the need for annoying zips or buttons, and enjoy a unique sleeping experience. Made from a breathable, easy-care fabric which offers exceptional comfort, you can print either a collage or single image on one or both sides, and the environmentally friendly dying technology will not peel or fade when you machine wash.
Our custom pillow cases are fun, fabulous and fast to make, so you can enjoy a unique decoration for your bedroom, and get a great night's sleep in no time. This means you can create completely personalized pillows, with no limits on your creativity. Once we receive your design online, we hand make all our personalized pillow cases using a soft, breathable, silky fabric with your picture - which thanks to the environmentally friendly dying technology won't fade when you machine wash. Your personalized pillow cases are made to order in just a few hours after placing your order, which means you don't need to wait weeks on end to receive your product from Bags Of Love. The pillowcases arrived very quickly and are exactly what I had hoped for - lovely quality and sharp graphics! I will order again from Bags of Love - thank you so much! I absolutely love the pillow case I created! The case is extremely soft and I can't wait to give this to my husband to use when he is recovering from surgery. I'm an artist and was very pleased with the quality of printing for my original artwork. I was pleased with the fabric quality as well. You saved our Xmas day. I ordered two pillow shams with my late mother's picture from somewhere else,with a month to build and ship. Got just one, terrible quality and 4 days before Xmas. Worst cs ever told me nothing they could do about it. Frantic, i found your website and in three days i had your pillow sham in my hands. Not only we're you mega fast, your quality amazing & great design, but it had special meaning you saved this day. When my daughter opened her present she loved it and loved the design and wouldn't have wanted it any other one. Thank you!!! Like many of our products, the photo pillow case comes with a quantity discount, so the price per unit is cheaper the more you buy. Design a whole set for the household and enjoy a sleeping sensation like no other. What will you print on your personalized photo pillow case? Click start design above and let your imagination wander. Your personalized pillow cases are handmade to order by our expert seamstresses. Using a specialist printing technique that bonds the inks deep into the fibers of the fabric, your designs are bold, rich and vibrant with details coming through exceptionally well. The fabric itself is a Peached Poly fabric, so it's soft, breathable and cool to the touch. 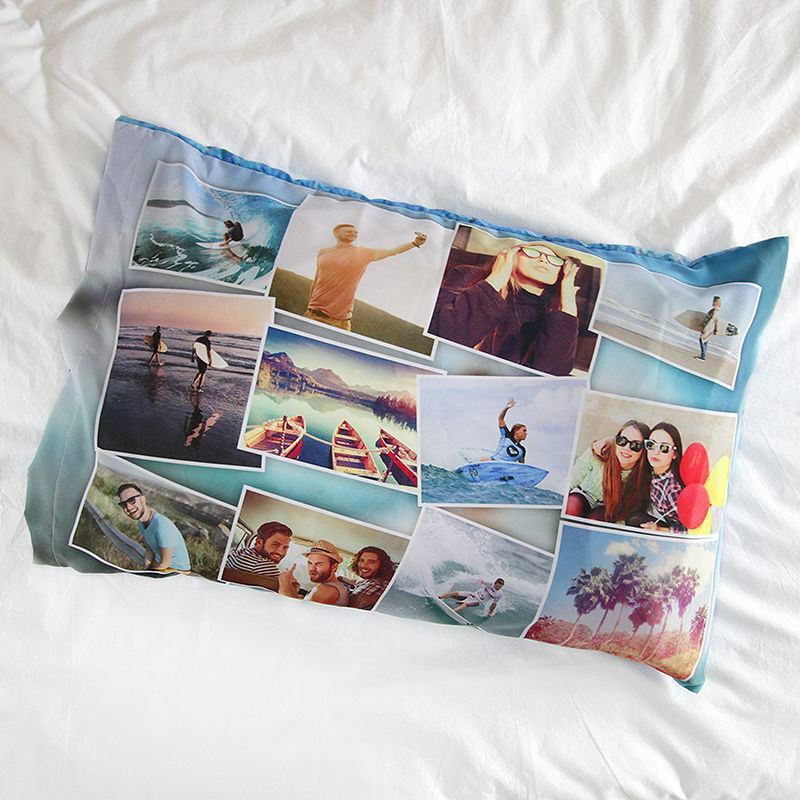 Hand sewn together with a neat slip and flap closure to tuck your pillows in, your photo pillow case is a wonderful gift for friends, family or even yourself. Care: For best results, machine wash at 86°f and either tumble dry on medium or dry flat. Ironing isn't necessary. If these care instructions are followed, your print will last a lifetime. If you're printing on the back of your photo pillow case too, please consider the bleed margin for the slip and flap closure. Within the design interface, you'll notice a dashed line that indicates where the flap closure is positioned. Any design that is placed within this dashed line will be printed onto the flap used to tuck away the pillow. If you have any important features or text on your photo, make sure this isn't placed in the flap area. Use the design tool to edit your image, zoom in so that you can see your images extra large and make sure everything is perfect, and preview to double check you're happy with your design. You can also design a fun photo collage featuring loads of your best snaps. Simply upload your pictures and select more than one in the design tool to create a collage. Choose from ready-made montage styles or edit and rearrange the pictures manually for a truly bespoke photo pillow case gift that someone will just love. Design Christmas themed slip covers and snuggle up in winter with festive personalized pillows. You could print a photo from your children's first nativity play as a loving - albeit slightly embarrassing - memory gift. Personalized Christmas pillowcases like this can become part of your family's festive traditions, as each member can have their own. If your best friend is getting married or has already tied the knot, design a special photo pillow case personalized with 'Mr and Mrs Smith' and a cute photo from when they first got together. For any nights spent apart, their personalized pillows will be the next best thing to having their partner by their side. When your children grow out of their cot and get a proper bed to themselves, make the transition an exciting one with personalized pillow cases. Printed with family photos and pictures of their favorite cartoons, nodding off shouldn't be an issue, and you might get a better night's sleep too. Custom printed bedsheets. We print and sew your sheets into beautiful bedding for home or personal gifts.